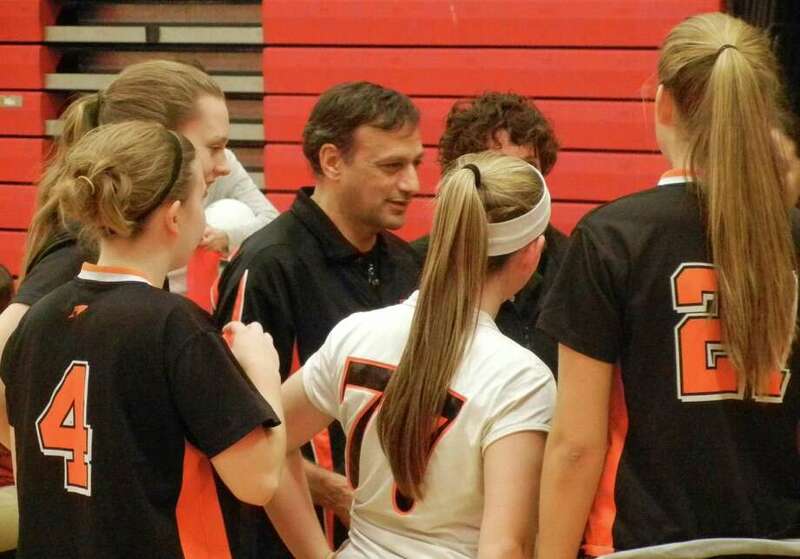 Stamford coach Mike Smeriglio talks to his team between games on Wednesday, Oct. 23 in Fairfield. The Knights beat Warde 3-1 in an FCIAC girls volleyball match. FAIRFIELD — Fairfield Warde’s run of 11 wins in its first 13 matches has turned into a stretch of four losses in its last five contests after a 3-1 FCIAC girls volleyball loss to Stamford on Wednesday night at the Mustangs’ gym. The loss hurts their chances for qualifying for the FCIAC tournament that begins on Tuesday. A win against Ridgefield, which is 13-4, at home on Friday will help. Stamford, Warde, Ridgefield, St. Joseph and Danbury are vying for the last four berths in the conference tournament. One team will be on the sidelines, preparing for the CIAC tournament. Stamford, which had lost four of seven after opening 2013 at 9-2, improved to 13-6 overall after its 25-7, 22-25, 25-10, 25-15 victory over Warde. The Mustangs fell to 12-6 overall. Both teams now stand at 11-6 in the FCIAC. “We had probably our lowest (number of) errors for the season,” said Black Knights’ coach Mike Smeriglio. “That keeps you in all games. We were nervous playing Warde. They’re a well-coached team, they went five games with Ludlowe, and we were playing in their gym. “Tonight, we had the passing. It has improved the last four games. You can’t do anything without the passing,” Smeriglio said. The Black Knights can accomplish much behind the contributions of captain Brianna Gordon and Anne Ellertsen, season-long leaders for the team. Gordon supplied 20 kills and six blocks on Wednesday, most of which seemingly arrived at pivotal times, often stifling Mustangs’ rallies. Ellertsen, a junior, collected 16 kills and two blocks, again delivered mainly at opportune times for Stamford. “Brianna did everything tonight. She’s very talented,” Smeriglio said of Gordon, an All-FCIAC selection in 2012 as a junior. Stamford was the more consistent and error-free team on Wednesday. In each game, the Black Knights opened early leads and held off the Mustangs except in the second game. In Game No. 1, Stamford got out to an 8-3 lead. After their advantage was 16-5, the Black Knights closed out the opener with a 9-2 spree. In Game 2, it was a 7-3 lead, then an 11-6 advantage before the Mustangs put together their best stretch. Warde trailed 17-10 before going on a 15-5 run to win the game. In the third game, Warde fell into a 7-0 hole before the deficit grew to 15-3. Winning four of the next five points by Warde made it 16-7, then Stamford asserted itself again to roll to the win. In the fourth game, it was 8-2 Stamford before Warde closed to within 11-7. Another strong stretch by the Black Knights left the score at 21-10, prior to the Mustangs grabbing the momentum for a push that was eventually stopped by Stamford. “We kind of have to learn from our mistakes,” Warde coach Matt Narwold said. “It’s taking too long for the team now (to learn from the mistakes). We have to adapt quicker to the team we are playing. Records: Stamford 13-6, 11-6 FCIAC; Warde 12-6, 11-6 FCIAC. Highlights: S—Brianna Gordon had 20 kills and six blocks. Anne Margaret Ellertsen had 16 kills and two blocks. Lexi Nikolopoulus had eight aces and 12 service points. W—Kaitlin McKenna had 17 kills, two blocks and three digs.